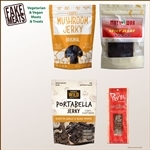 FakeMeats.com is always adding new vegan and vegetarian jerky, meat substitutes, snacks, and more. These are the newest products we've added to our lineup! Try some new Fake Meats today!